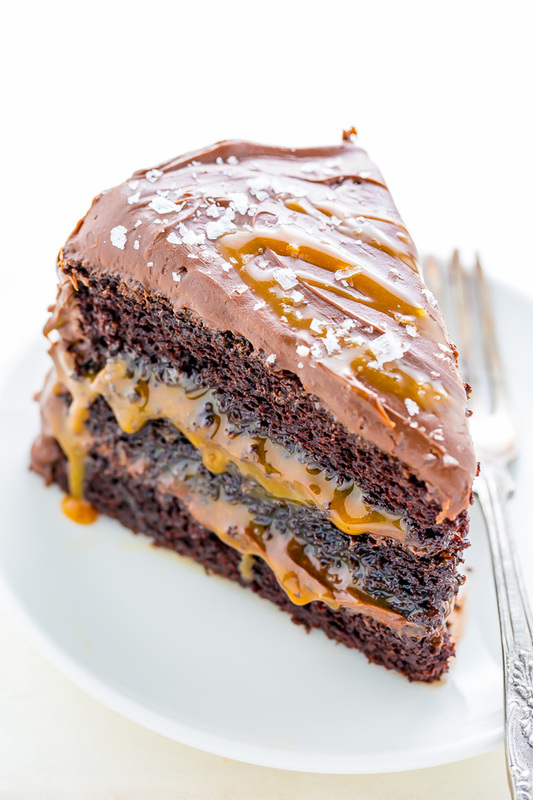 This Salted Caramel Chocolate Cake is moist and sinfully decadent! 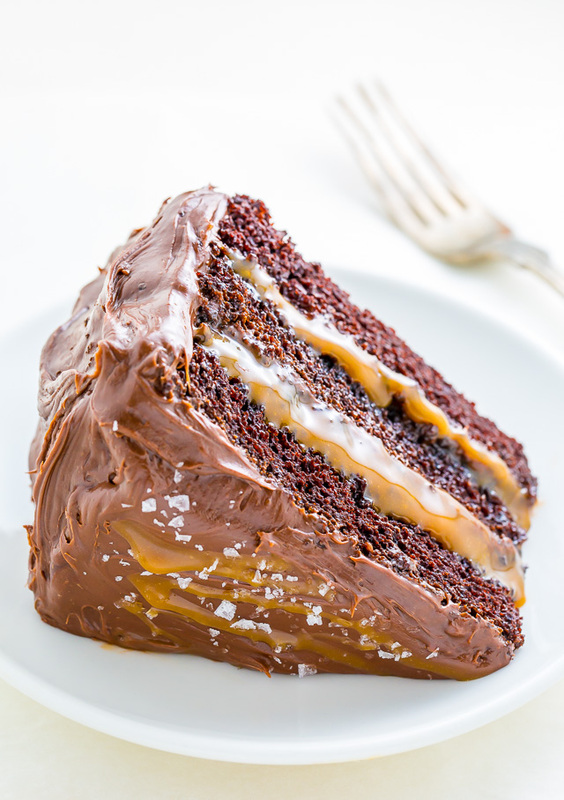 So if you love chocolate and caramel, you’ll LOVE this easy recipe for how to make Chocolate Caramel Cake! Tomorrow is my birthday and I’m currently feeling ALL of the feelings. Also currently in the car, driving to the beach, eating a giant slice of cake and chasing it with an iced coffee. If today is any indication of what 29 is going to be like, I think this year is going to be pretty darn great! Now as you know I’m a diehard chocolate lover, so it’s no surprise my birthday cake this year is a salted caramel chocolate cake! It’s three layers of heaven! And surprisingly easy to bake. Finally, I decided to full on treat myself and create a cake that features BOTH chocolate and caramel! Because why not, right?! This recipe calls for vegetable oil, but you can use an equal amount of canola oil or melted coconut oil in its place. I do not recommend substituting oil with butter. The cake layers should all be baked on the middle rack of your oven. If there’s not enough room in your oven to bake them all in an even row at once, simply bake them in two batches. For the frosting, you’ll want to make sure your butter is VERY soft before creaming it. The chocolate cakes should be completely cool before adding the frosting and salted caramel. The assembly is a two part process: you’ll place one cake level on a large plate, top it with a thin layer of frosting, then add the caramel, then add another cake level and repeat. Once you’ve added the final cake level you’ll want to leave the top bare and place the cake in the fridge to set for one hour. Once it’s set, you can finish frosting. ↑ But seriously, can everyday be my birthday?! 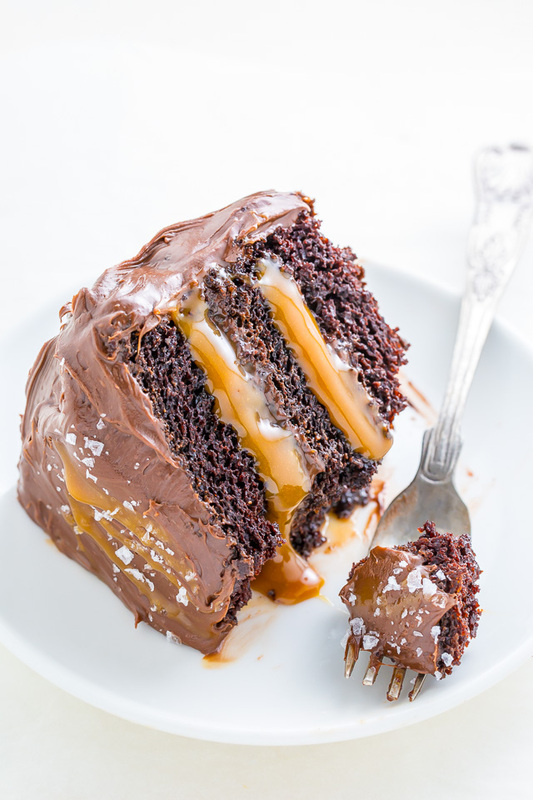 If you try this recipe for Salted Caramel Chocolate Cake, let me know what you think! Leave a comment below and don’t forget to snap a pic and tag it #bakerbynature on instagram! Seeing your creations makes my day. In the bowl of a stand mixer fitted with the paddle attachment, or in a large bowl using a handheld electric mixer, combine both sugars, flour, cocoa powder, baking soda, baking powder and salt; mix on low until dry ingredients are thoroughly combined. Use your hands to break up any large clumps, if needed. In a separate bowl combine the eggs, egg yolks, sour cream, milk, oil and vanilla extract; mix until completely combined. Pour mixture into the dry ingredients and beat on low until just incorporated. Pour in hot water and continue mixing until completely combined; about 1 minute. The batter will quite thin. In a stand mixer fitted with the paddle attachment, cream the softened butter on medium-speed until completely smooth; about 3 minutes. Turn the mixer off and sift the powdered sugar and cocoa into the mixing bowl. Turn the mixer on the lowest speed and mix until the sugar/cocoa have been absorbed by the butter; about 2 minutes. Increase mixer speed to medium; add in vanilla extract, salt, heavy cream and salted caramel; beat for 3 minutes. If your frosting appears a little too thin, add a little more confectioners' sugar; If your frosting needs to be thinner, add additional heavy cream, 1 tablespoon at a time. Using a serrated knife, carefully trim the raised top of each cake, making each one an even, level surface. Transfer 1 layer to a large plate or cake stand. Spread a thin layer of frosting on top, then add a 1/2 cup of caramel; top with another cake layer, and repeat, thinly spread it with a layer of frosting, then adding a 1/2 cup of caramel. Top final cake layer and place cake in the fridge to set for 1 hour. Once set, finishing frosting the top and sides of the cake. Sprinkle with sea salt. Slice and serve, or keep refrigerated for up to 5 days. Cake may be baked up to 5 days in advance and stored in the fridge. Unfrosted cakes may be wrapped and frozen for up to 2 months. For best results, follow the recipe as written. omg i (really) just drooled. WOW . yummmm. I’m not Sure when you will read this, but i have 2 9inch cake pans, and a 9 inch spring form cake pan. What do i do? the most decadent cake ever!! rave reviews from friends and requests for more!! Where do you get salted caramel sauce? Trader Joe’s has an amazing caramel sauce and/or dulce De lechery!! Trader Joe’s has an amazing caramel sauce and/or dulce De leche!! isn´t too sweet 3 cups of sugar? Can I use one of each? Do you think the cake will be as good as the original recipe with only 2 cups of sugar? Where do I get salted caramel and flaky sea salt? I really want to bake this for my husbands birthday so please help. This looks amazing! Today is my fiancé’s birthday and this is the cake our daughters and I are making him! Wish us luck!!! HOW TALL SHOULD THE CAKE PANS BE? ON AMAZON I AM SEEING ALL DIFFERENT HEIGHTS AND NOT SURE WHICH HEIGHT TO BUY. THANKS. I would make this but the recipe doesn’t mention pan sizes. Recipe says to cut 3 9″ rounds of parchment paper. So you need 3 9″ pans to put the paper into to. HAPPY BIRTHDAY, and thank you for bringing a little bit of sweetness into my life everyday (I check your website all the time.) We could all use a sweet smile in today’s world. Best to you on your big day! Celebrate to the max! YUM~ This looks delicious! Happy Birthday!!! Sorry for the belated birthday wish. I hope it was grand. Honestly this cake looks AMAZING. Death by chocolate? Yes. Please. Great, great post, thanks so much for sharing, Ashley, and happy happy birthday! So yeah, I’m totally drooling like crazy right now. This cake is absolutely INSANE! Cannot wait to try it out! Yay!!! Can’t wait to hear how it turns out Karly! I made this cake for my mom’s birthday over the weekend and it turned out AMAZING! Rich and moist but not dense. Thank you so much for this recipe. I will definitely be making it again. Question, have you ever thought of adding brewed coffee instead of hot water? Not that this cake needs more flavor, just curious of you have ever tried it. So happy this cake was a hit, Emily! You could definitely use an equal amount of hot coffee in place of the water. woww…its yumm,,,the pictures are really tempting!! loved your blog.. This recipe is out of this world! I have one question? It was a little “gritty” (best word, I could come up with), any thoughts as to why or what to do to fix that? It still tastes fabulous, I just wondered what that could be. Hi Chele. I’m so happy you enjoyed the recipe! I’m having a hard time imagining how this cake could be gritty, so I’m not sure why yours came out that way. If you can expand on gritty in more detail I may be able to help… was it dry? too wet? I made it a second time and it was perfect, no idea what happened that first time! I have literally made like 6 of your desserts, keep them coming! You are my go to for desserts! Would that not be the salt? So I was about to start the frosting portion and noticed it said to add vanilla extract in the directions but I don’t see vanilla in the ingredients list for the frosting. How much am I supposed to be putting in? It is posibble to use dulce de leche instead of caramel sauce?? This cake looks droolworthy. I would definitely bake it over the weekend. I have got one question though. Does the batter stand for some time? I don’t have multuple tins. So, i would have to bake it in batches. Hi Neha. I would recommend using multiple tins as called for because the cake batter has active ingredients in them that will develop and change the batter as they sit. I hope you get a chance to bake it! I was wanting to make this cake tomorrow and I noticed in the frosting it says to add vanilla in the instructions but it is not listed in the ingredient list so I was wondering how much vanilla to add. I only have 1 cup of sour cream, do you think I could use 1/2up greek yogurt instead? Never mind, I went and bought some more sour cream. I made this cake today for a party tomorrow, can’t wait to taste it! Hi Jill! I think full-fat Greek yogurt would work, but the texture may be a little different and the taste may be a little more tangy. Hey there I soooo want to make this cake for my mother in laws bday this weekend but I have only 2 cake pans their sizes being 23 cm x 23 cm x 3.5 cm. Would you be able to give ingredient ratios for a 2 layer cake please??? I made this cake at the weekend and it was amazing. Best chocolate cake I have come across and the frosting was gorgeous. Not too rich but just enough flavour. Could I use this sponge recipe for cupcakes? Hi! Can this cake be baked in one 9 inch pan? And then cut it in three layers once it is cooled? Hi Inge. There will be too much batter to fit in a 9″ pan. Looks amazing, I will be making this recipe for a good friends birthday this weekend. I just want to check cup size please. Is one cup 250ml? someone asked you if she Canadian put coffee instead of just water. Do you think its a good idea or the cake will mostly taste coffee? Hi Nicole. Putting the cake in the fridge for an hour will not dry it. You can substitute the hot water for coffee but it will affect the taste a little bit. This cake is crazy delicious!!! But i ‘m from portugal and here use grams, this cups are US or UK? Hi! I made this cake for a family bake off, and it was AMAZING. It won, and everyone loved it. So much so I’m being asked to make it for a Christmas party, and I’m wondering if I wanted to make it in 9×13 would you recommend doubling the recipe? Or just an extra half of the amounts? Your thoughts would be appreciated! Sorry I misunderstood, Cali! If you were going to do multiple layers you’d definitely want to double or possibly even triple the recipe. I am planning on making this cake for my dads birthday in a couple of weeks. I need to purchase cake pans. There’s a Wilton set of three pans for $11.99, but they are an 9″, 10″ and 11″ – could that work for this cake? Or do the pans have to be the same size? Can I replace sour cream with Greek yoghurt in this recipe? I made this cake for our family Christmas, with just a few adjustments. First, let me comment on how absolutely magnificent this cake tastes! I can’t wait for another special occasion to make it! I normally do not either comment on or make twice a recipe I try from Pinterest. This recipe “takes the Cake”! My adjustments were, I baked in a large 10 x 14 baking dish, (it takes several minutes longer to bake) and halved the icing recipe. Absolutely scrumptious! WOW, WOW, WOW and again WOW! Hi! I’m planning to make this for my birthday party on Saturday. Can I make the frosting on Wednesday and the cake on Thursday, and then assemble on either Thursday, once the cakes cool, or Friday? (Basically, can I make the frosting ahead of the cake?) Thanks!!! Nevermind! I realized it made no sense/there was no reason to make frosting before cake. Cakes are done as of a few minutes ago and frosting/assembly will be done tomorrow! Thanks for the recipe! Everyone is super excited to try it! I need to make a wheat free version of this. Cup for cup gf baking mixes aren’t as good as a boxed mix. I’m trying to figure out conversions using 2 boxes of mix and the wet ingredients. The recipe calls for 5 cups of dry ingredients, I think…..would the wet be the same as the recipe, or should I make 1 box and figure the conversions. Any help with any of that will be wonderful! I just caught you were talking about a box mix. Skip that and use follow my directions with a good gluten free flour. It will be cheaper and better. I use Betty Crocker Gluten Free Flour as the replacement. It turned out great! I am drooling over this recipe! I would like to make this cake for my daughters upcoming birthday. Do you think that I could substitute vegan sour cream and non dairy milk (soy milk, coconut milk)? She has had to give up dairy but I know she would like this cake! I’m just wondering if this recipe is good if it’s covered in fondant? When you took those pictures, had the caramel Cooled at all? Im afraid that after chilling the Caramel will become solid. If it sits in a refrigerator overnight, do you have that problem? Hi. This cake looks so delicious. Will definitely try it for my son’s 3rd birthday. I have one question though. I have a load of caramel candy leftover from christmas. Is there any way i can use it for the caramel sauce? I’m wondering is the salted caramel layer will be hard to cut into after the cake being chilled in the fridge. Or do I need to thaw the cake to room temperature before I slice then. Can I make this a day ahead or will that cause sogginess? Hi Sam. You can make it the day ahead and store it in the fridge. Just let the cake sit at room temperature for 30 minutes before slicing it. Hey,hope you well!Just wanted to find out if i can substitute buttermilk for the sour cream? Can I use icing sugat instead of confectionery sugar for the frosting? Last time I used sugar and it didn’t taste as good. You could still feel sugar on your teeth. The whipping cream makes it so smooth! You said to add all the wet ingredients and caramel to the dry ingredients to mix.I’m not sure that I follow you.Do you make some caraml to go into the cake and then some to put between the layers? Hi Mary. Step 3 should clarify this process 🙂 You do not add any caramel into cake batter. I’m confused, you said to mix all the wet ingredients and caramel into the dry ingredients. Do you have to make a batch of caramel to go into the batter and then one to go between the layers?Please clarify. Hello! I made this cake for my husband’s birthday! The cake was so divine, rich, chocolaty….wonderful. They baked perfectly and no cutting off tops. They were huge, big nice sized cakes. The frosting was wonderful, it was fluffy and rich and amazing! The caramel….I was short on time. I bought a salted caramel, by Smuckers. I searched for other brands, But this one looked great. It was great. Until all the caramel started to drip out of the cake. Any opening….caramel dripped out. I thought about poking holes in the cake and drizzling the caramel and letting it soak in…then frosting the layers. I should have. By the time hubby’s office cut the cake…the caramel was flowing out. It was ooey gooey. BUT delicious!! I froze it for a while and it slowed the oozing down, but….still oozed caramel. Any suggestions? I should make the caramel the next time; maybe it’s thicker and won’t ooze out. Over all, the cake was a wonderful hit, I was just sad that the caramel didn’t stay put!! I will try again, and oh..the heavenly taste of the caramel and the chocolate frosting ..and the divine chocolate cake. We loved it…..we could have made a trifle bowl out of it, and ate it with big ol’ spoons! haha! Thanks so much! Hey there, the link the the caramel sauce you used is no longer working. Can you tell me what the caramel sauce you used was? Thanks so much! Can you make these into cupcakes? I would say yes. You will just have a lot of cupcakes with the full recipe. I would cut it in half and you should still get at least 12-15 cupcakes. Thank you for this recipe. My daughter wanted a salted caramel cake and my son wants cupcakes! Both recipes look amazing and I will be busy making a cake and cupcakes and can’t wait to try both. I did it and absolutely love it!!! 2 Tablespoons vanilla in the cake and 1 teaspoon in the frosting, correct? I plan to make a two tiered cake. 3 9″ layers on bottom and 3 6″ layers on top (using a different recipe as we want the top tier to be vanilla). Will this cake with the caramel inside be sturdy enough for this? 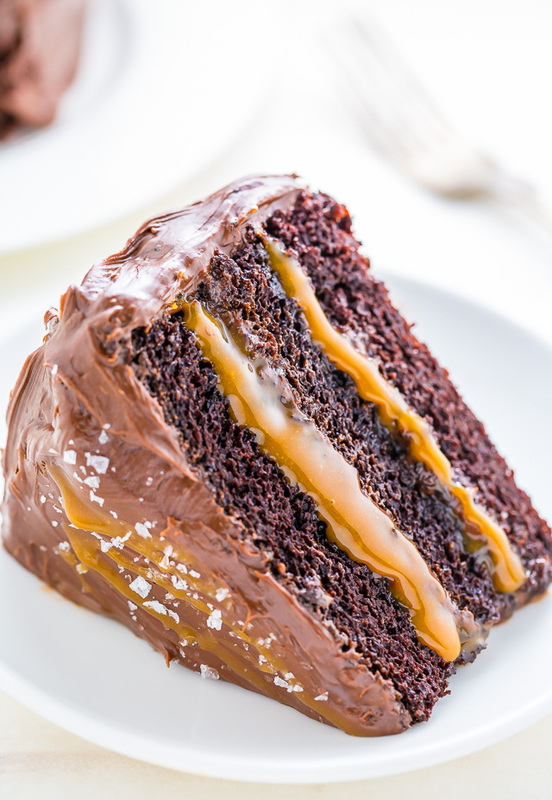 This is the most gorgeously chocolatey, caramel-y piece of cake I have ever seen! Amazing recipe and photos! 🙂 Looks beyond decadent and delicious!! Wow. This was scrumptious. Thanks for sharing a great recipe! So happy to hear it, Nina! More than one person seems to have questions pertaining to pans used in this recipe. I for one, do not like baking cakes separately because I think they tend to be drier plus you have more crust to contend with. I think keeping it whole and then cutting into layers is a fine option especially for those who don’t have or want 3 pans. Do you know how many cups this batter yields? That would help in selecting either a wider or taller single pan, be it square or round. Then all that would remain is adjusting the baking time and/or temperature. I would really love to make this so I hope I hear back from you Thanks…..
I’ve made this 3 times now and every time it has turned out AMAZING!!! Thank you SO MUCH for sharing this super yummy recipe!! I came to the site today to print the recipe so I can make just the icing for some vanilla cupcakes for a friend’s birthday party tonight! Hello! is there any chance to have the ingredients in european units? I would love to try it. What drink did you pair with this temptation of salted caramel chocolate cake? Red wine or coffee both go great! I just made this cake and the center sunk in a bit. Has this happened to anyone else? It’s cooling off now and it sure smells good. Can’t wait to taste it. This is the ultimate BEST chocolate cake recipe EVER!!! It’s a must have in your recipes!!! I have a dumb question. I have the caramel sauce that you sent a link to……I assume I need to add the salt to that? How much? Just stir it in? Help please, making this for my wife’s birthday. I just ordered the caramel sauce and plan on making this cake for New Year’s Eve. I’ll let y’all know how it turned out. It looks fabulous! I used this carmel sauce recipe! Everything looks amazing! And it makes a huge cake! Thank you for sharing! Xoxox from Idaho! Just wondering if u can put fondant on the cake?? Where do I find the caramel sauce recipe? I want to make this for my grandsons birthday. I made this cake for a coworkers birthday yesterday and everyone loved it! I got reviews that I’m not allowed to make any other cake and others said it was the best cake ever and I’m not allowed to make it again. The cake went in 30 mins and today I have people asking me to turn the recipe into cupcakes and make the cake for a husbands birthday. My question- have you ever made this recipe into cupcakes? I’m guessing it would make quite a few which is perfect for my coworkers. I made this cake gluten free and it was absolutely amazing!! This is by far the best gluten free cake I have ever made! Delicious!! 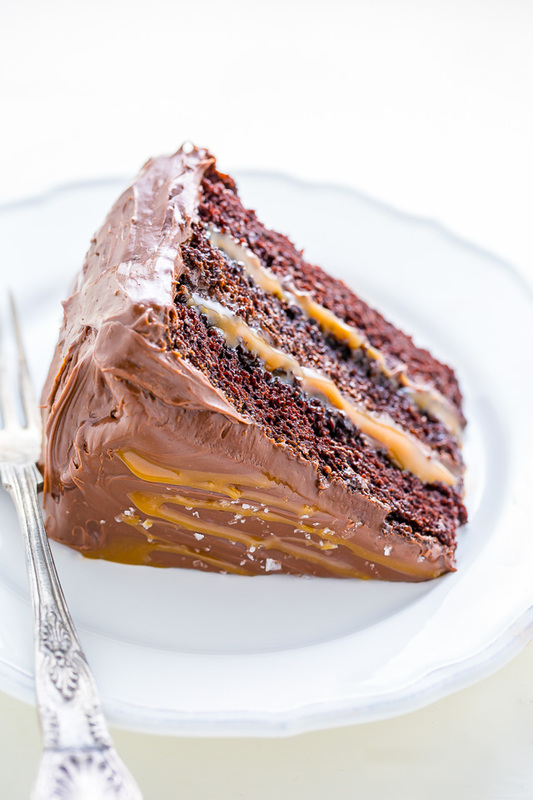 Will one batch of your homemade caramel sauce be enough for this cake or should I double it? I made it it was awesome and heavy cake! Oh my goodness, best cake I’ve ever made. So GOOD!! Very moist and soft. Great flavor!! I was generous with the caramel in the frosting. I also made the homemade caramel, and I had to quadruple the recipe. Well worth it though. Also DEFINITELY ake sure the cake is cooled before frosting and adding caramel to the layers. I didn’t the first time I made it and I couldn’t put nearly as much caramel in the layers. Lastly, I substituted hot coffee for the water. Added BEAUTIFULLY to the flavor of the cake. I definitely recommend trying this recipe! Will this cake travel well? I was asked to bring dessert to a picnick, that is an hours drive away. This looks Devine! Great recipe, Ashley. Thanks so much for sharing! I made this recipe for my mom. I did the thin layer of frosting in between the layers and of course had to make a ring of frosting to fill and keep the Carmel filling in may have used a little extra Carmel filling and frosted as normal. Then I decided to make it a little more decadent and special so I made 2 rings of buttercream flowers around the top and bottom edge then filled the middle of the top of the cake with the rest of the Carmel I had and sprinkled the sea salt alk over the top. So just a little extra since Carmel is my moms favorite. Wanted to post a picture but didn’t give me the option. Thanks so much for the wonderful recipe for us home bakers also I made it gluten free since we have celiac disease. I used Ghirardelli salted caramel sauce that I found at walmart. The cake was so moist & the frosting was to die for. Thank you for the recipe! I just made this for my boyfriend’s birthday (he’s a salted caramel fanatic). The cake portion turned out exceptional – perfectly moist without being dense. However, I felt that the frosting was a little too fluffy. Was it meant to be fluffier or more like a fudge frosting? Maybe this is just my preference in that I prefer a more fudge-like frosting :). I just made this cake and my frosting turned out fluffy like a whipped frosting. Is that how it’s suppose to be? It’s also lacking in flavor/richness & it’s very light in color. The frosting in your picture doesn’t have a whipped look& appears to be rich, full of flavor with a beautiful dark color. Please tell me what you think I could’ve done wrong. I didn’t even finish the final frosting step. I left in fridge with hopes of correcting the problems. I actually just made this cake for my own birthday! It’s delicious, and was a big hit with my family! The only problem is, the caramel layers are not at all oozy like yours – the caramel seems to have all been absorbed by the cake above it. It’s not bad – the cake is EXTRA moist! But I was excited about the gooeyness and it’s lacking. Any tips on how to avoid that? Isn´t too sweet? Can I use one of each? Do you think the cake will be as good as the original recipe with less sugar? I made this cake for our sewing group. We had 5 birthdays today. This cake was a huge hit. Thank you so much. I used store bought caramel sauce this time but plan to make the salted caramel sauce next time. Hugs to you. This cake is awesome! We put it in the fridge after the was finished and microwaved each piece for 15-20 seconds. It was amazing, like a molten lava caramel cake. Will absolutely make again!! Thank you! Ok, this is baking in my oven right now. We were eating the batter, it was so good!! I’m going to let it cool, then wrap it and refrigerate it and make the frosting tmrw and assemble for Christmas! Also about to go make the caramel sauce! This cake is seriously the BEST chocolate cake I’ve ever had! The salted caramel part is why I chose this recipe, and glad I did, the chocolate frosting alone is absolutely amazing! The salt adds a great balance with the sweetness. I hardly ever made a cake from scratch, but now because of this one I’ll never use a box. Plus I’m gluten free, I just substituted a 1:1 gluten free flour, and it tasted like a regular cake. I’ve already made this a couple times, even though there are a lot of steps, it’s totally worth it!!! Can I use this frosting for frosting smoothly 4 tier cake ? Wow. Made this cake today and had to give the rest away or would have eaten it all myself. I used my own caramel sauce and frosting recipe for the cake. I forgot to set in fridge for an hour before frosting top layer. My cake was a leaning mess but I did not care, it was so good!!! Next time will make sure to set in fridge!! !